King Henry VIII’s extravagant Hampton Court Palace turned 500 this year. The colossal collection of buildings and gardens, and the extravagant antiquities that fill it, is a mind-boggling rabbit warren that show’s the excesses and follies of the Tudor era. On the outskirts of London and by the Thames, the huge property not only houses the Palace, but has extensive gardens that include the Maze, Privy Garden and the Royal Tennis Courts. Whether by guided tour or using the provided audio guide, it’s easy to get lost in history whilst delving into the very public and private life of the former king. Formerly used as Queen Elizabeth 1’s private kitchen, the discreetly located Privy Kitchen café was built in the late 1550s. The 16th century style dining hall offers a refectory style of dining as well as a smaller, more intimate dining room next door. 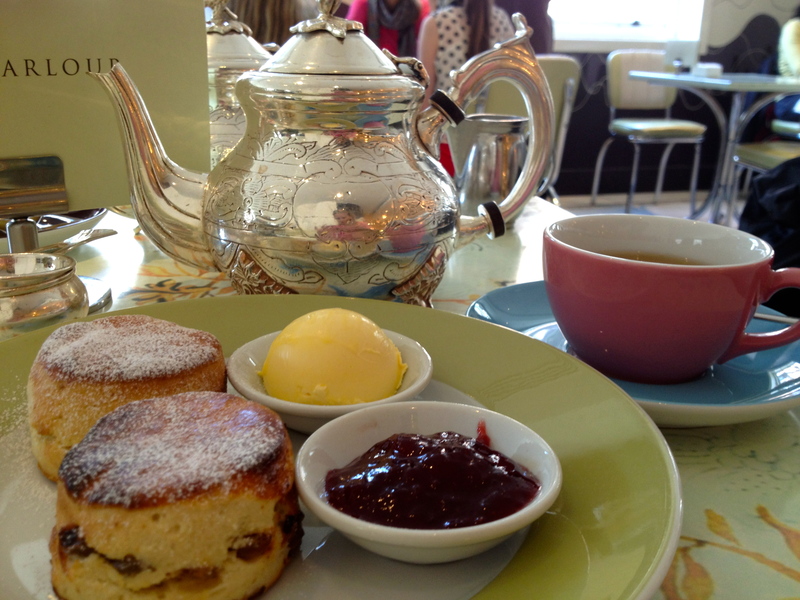 The café dishes up a no-frills morning or afternoon tea of scones, Tiptree strawberry jam and Rodda’s clotted cream. The fruit scones are yet again served at room temperature and by lunchtime, my scone is leaning towards the dry side. Hampton Court Palace shows the fascinating history of the Tudors and is well worth a visit, and if the Privy Kitchen café doesn’t suit, there is always the Tiltyard Cafe to try. Tea: A basic selection of Twinings tea bags served in a mug. Overall: Sporting a 16th century vibe, it’s cosy in lousy weather. Founded in 1909, the four Richoux restaurants, prestigiously situated in the finer corners of London, have been known for their patisseries. I try the Mayfair establishment, tucked away from the hubbub of Oxford Street and Park Lane. A lovely place for morning or afternoon tea, it emanates the classic tea room vibe although it is more lunch time when I stop by. There’s an array of clients; tourists, businessmen and women, and lingering locals. 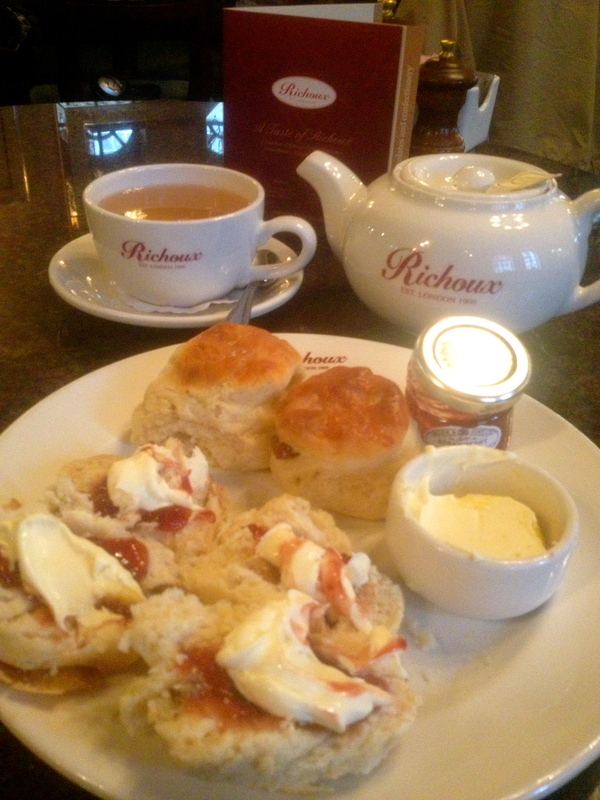 I have the Richoux Cream Tea, which consists of four warm baby scones with strawberry preserve and Cornish clotted cream. The service is pleasant and attentive and there isn’t a problem when I ask for a second pot of jam. The two plain and two fruit scones are gluey with a slight aftertaste, displaying the telltale signs of too much microwaving. A shame as I love the surrounds and the Cornish clotted cream. If you want to take something home with you, Richoux do a range of chocolates and biscuits, you can even get them to make your wedding cake! Tea: A choice of blended, green and herbal tea bag teas served in a good-sized pot. Overall: Cosy tea room vibe serving traditional English food. There’s nothing finer than a stroll, run or ride through one of London’s Royal Parks and Gardens. Covering 350 acres, Hyde Park is a huge green space, and home to the Diana Memorial Fountain, Speaker’s Corner, and the Serpentine Lake. The lake not only is the centrepiece of the park but also offers boating and swimming. Records show that informal swimming groups have plied the waters since the early 1800s, and the Serpentine Swimming Club formed in 1864, still exists to this day. Although you can’t see the swimmers from the Serpentine Bar & Kitchen (you have to visit the Lido Bar & Cafe for that), you can still sit lakeside or within the glass-walled cosy confines of the buzzy café and admire the view. Avoid the lunchtime queues and visit either side for a more relaxed experience, plus you are more likely to nab an outside table or deck chair in milder weather. There’s quite a morning/afternoon tea spread, including a towering stack of large fruit scones. This is my first ‘cream tea’ in the UK (on this trip), and I quickly learn that as the norm, scones are served at room temperature. These scones are slightly crisp with a surprisingly fluffy centre, and go down well after my overnight flight from Hong Kong. The miniature jar of Tip Tree strawberry jam could be bigger, but the chilled tub of Rodda’s Classic Cornish Cream doesn’t disappoint. Tea: A good range of loose-leaf teas served in a no-nonsense pot. Overall: A hugely busy café with the added serenity of being in the middle of Hyde Park. The Tea and Tattle, is a traditional tea room boasting the most affordable quality afternoon tea this side of the Thames. Considering it’s location opposite the British Museum in the Bloomsbury area of London, there’s probably some truth to that. Housed in the basement of the Arthur Probsthain Bookstore, you could say that the tea room has a captured audience, and that’s before the overspill from the British Museum (if they run out of scones at their own café). Established in 1903, the bookstore was once known for it’s vast library of books that were piled high, filling every inch of space in the store. Nowadays, it’s less on books with the addition of music, film and gifts as well as an Oriental and African art gallery. I’m alone, as my partner has opted to remain lost in the bowels of the Museum while I explore Tea and Tattle. Luckily I get the only table left. It’s not ideal, squeezed against a wall near the cafe’s semi-office? Space is tight and every table filled. I hate to say it but the service has a ‘tourist tired’ feel. It may just be my imagination, but perhaps some of the staff have had a long day? My scone arrives swiftly, ready-made and ready to go. The cold but tasty plain scone (unusual for England as they seem to be big on fruit scones) arrives halved and dressed with my chosen raspberry vanilla jam. It’s rich and fruity, one of the best I’ve had. Along with this one, there are three other jams and a marmalade to choose from, which all sound equally interesting and delicious: Bramble and Bramley, Damson, Strawberry and Black Pepper. The cream is clotted and spread on the scone with jam on top like a true Devon Cream Tea (Cornish Cream Teas are served with the jam on the bottom, like most Australians eat theirs). Tea: A good selection of tea. The menu states that it is loose-leaf, but I see no evidence as the tea arrives in the teapot with no tea leaves or tea bag. Overall: Super popular and cosy, and in a handy location. Westminster Abbey is without a doubt the most well known church in Britain. Even the massive queue and £20 admission fee can’t keep visitors at bay. The sheer scale and architecture, extensive history, and the fact that there are 3,300 people buried or commemorated here is extraordinary. Although the construction of the present church didn’t begin until 1245, there has been a church of some sorts at this London address since the middle of the 10th century. Since 1066 the Abbey has seen 16 royal weddings, countless coronations of English and British monarchs, and is the final resting place of 17 of them. To truly experience all that the Abbey has to offer, you’ll need at least a couple of hours, and then some more time at The Cellarium Cafe and Terrace just to regroup. Although set on two floors, with outdoor seating in the summer months, I only see the lower level of the cafe that’s near the kitchen, not realising that there’s more. Although I do find it rather peculiar that there’s no terrace – not one that I can see. Originally, the Cellarium was used to store food and drink for the monks. Now it’s a quiet and relaxing place that’s an ideal bolthole far away from the madding Abbey crowds where you can absorb the wealth of information from the audio guide. Expect to share large tables when busy and even though there’s a steady stream of diners, the service is unmistakably slack. The small jar of Tiptree jam is a cafe staple, well it seems so in London, and the clotted cream is as it should be – clotted. The fruit scones are very average and surprisingly dry, but you hardly notice it with the jam and clotted cream piled on top. It’s a shame, as everything else, including the pretty tea ware, is lovely. Tea: A small selection of loose-leaf teas served in a lovely teapot. Overall: The ideal location to recharge before hitting the streets of London. We are a bit rushed for time as our Chocolate Tour starts in 30 minutes and we still have to hightail it to Soho, but I am adamant on having a Devonshire Tea at the iconic Fortnum & Mason in Piccadilly. By the time I ogle every food item and inspect all the teas on the ground floor I am directed to The Parlour for scones rather than The Gallery or The Fountain restaurants that also serve scones. Perhaps it is my attire, or maybe the fact I am carrying a small daypack rather than a swanky handbag. Nevertheless we take a seat in The Parlour that is cheerily bright in a 1950s retro cafe sort of way and specialises in über expensive ice-cream sundaes. I am thrilled to have my tea served in a huge sliver pot alongside my colourful and not very dainty crockery – I can’t even express how excited I am to be here. The plain and fruit scones arrive lightly toasted, which kinda surprises me and reminds me more of an English muffin than a scone. The strawberry preserve is good enough, but the winner here is the Somerset clotted cream, the rich yellow blob that has the consistency of butter is faultless! Tea: An array of loose-leaf teas including traditional British blends served in a gigantic silver teapot – wonderful! Overall: La-de-dah with a big dash of touristy London. Love it! There’s something quite magical about wandering through St Paul’s Cathedral marvelling at the layers of history. The haul up to the dome to the Whispering Gallery is well worth it, but less so is the queue for the shuffle up to the Golden Gallery for a bird’s eye view of London, that you end up being pressed cheek to jowl with the next person. After the sightseeing is out-of-the-way and for a lovely respite from the hordes, head down to the crypt and for just a few quid more choose The Restaurant over The Cafe for afternoon tea. Once through the doors the noise from the cafe just disappears and you can sigh your relief. 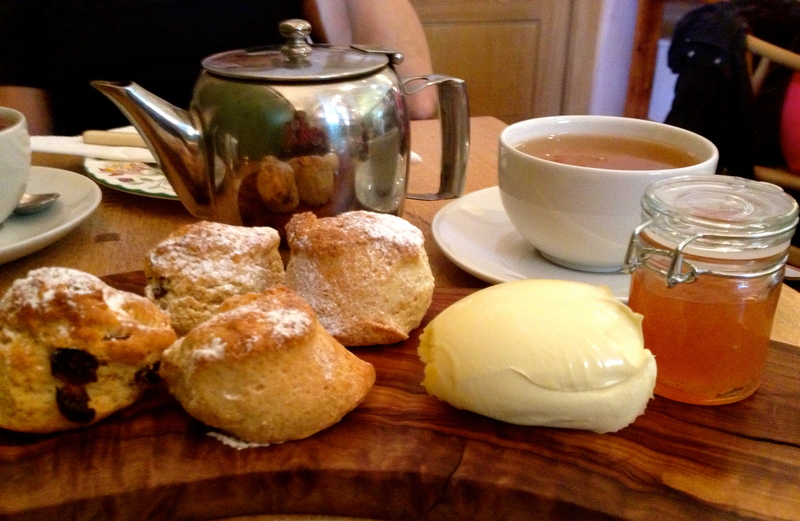 The Cream Tea is served up on a breadboard like wooden platter, which isn’t a problem as there isn’t much of it. Four bit-sized scones, plain and fruit, a dollop of Cornish clotted cream and a cute jar of homemade rhubarb and apple preserve – a serve for two. The scones are small and crusty but straight out of the oven, and my companion is impressed with the jam. Tea: Six choices of loose-leaf tea served in a good-sized pot. Overall: Poor value for money considering for an extra £5 you can get a high tea. Who wouldn’t like to have tea at Harrods in London? Forget about the eye watering prices, the tourists, or the queues (there are no reservations), because really it’s like mecca for scone lovers. The upmarket department store is the largest in Europe, touting 330 departments. Since 1905 the imposing Harrods building has dominated the Knightsbridge shopping precinct, and is a massive draw card for locals tourists worldwide. The upmarket department store is also the largest in Europe, touting 330 departments, so by the time you find The Tea Room, tucked away on the second floor somewhere behind the Christmas decoration department, you’ll need a cup of tea. We’re lucky, and slip straight in to a seat – no queuing. The Tea Room is bright and open, although seating arrangements can be a little close for more intimate conversations. There’s an extensive menu, but I’m here for The Chelsea (scones, jam and clotted cream). There’s a lot to take in; the matching Wedgewood floral tea ware, the Harrods shortbread biscuit served with the tea, the scoop of slightly yellow clotted cream, and the four different Harrods branded jams served in small jars. My choice is the blackcurrant, as it’s rich and fruity. I’m not a fan of marmalade, and I’ve had better strawberry and raspberry jam elsewhere. The fruit scones look impressive, but once tackled, they fall apart in large pieces. I’m surprised at how crumbly they are and once again, I’ve had far better. However, perhaps it’s not about the scones, but more about the reality that you are indeed at Harrods in London! Tea: A vast selection of Harrods’ fine loose-leaf teas served in a good-sized pot. Choose wisely as prices start at £5.00 a pot. If you have a spare £15, try a pot of the 22-Karat Gold Tea, Assam, a tea with leaves enrobed in 22kt gold leaf. Overall: A shopping institution that deserves bragging rights.